Here you can see Kevin's details at work. Shrink-wrap padding is held to the modified roll cage down bars with zip ties. Diamond plate protects the cargo area floor from an automatic transmission and tool box. 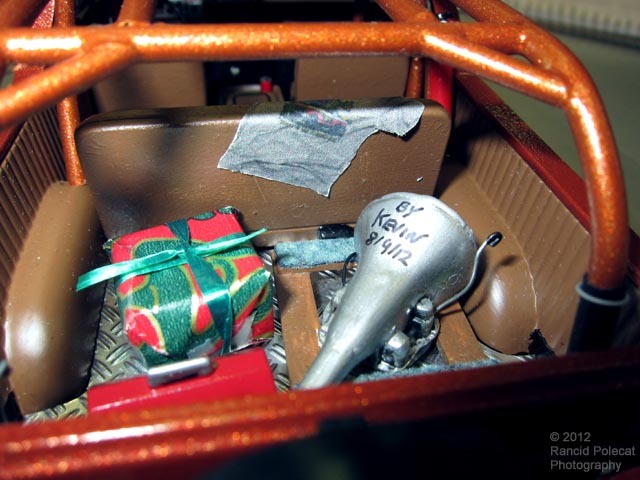 What could be in the gift-wrapped box - an aftermarket intake system perhaps? A little higher in the picture you can spot a photo reduced T-shirt draped over the rear seat and a red Coke can made from styrene rod in the console cup holder. Under the hood, Kevin detailed the engine with an oil dipstick fashioned of craft wire with the tip dipped in yellow paint and detail painted the molded-in accessories around the engine compartment.